Although December has many busy shopping days, many in-game currencies prices in our monthly RMT Roundup roster are very stable. The average discrepancy rate is even lower than 15%. However, SWTOR US Credits and WoW Gold are different from others. 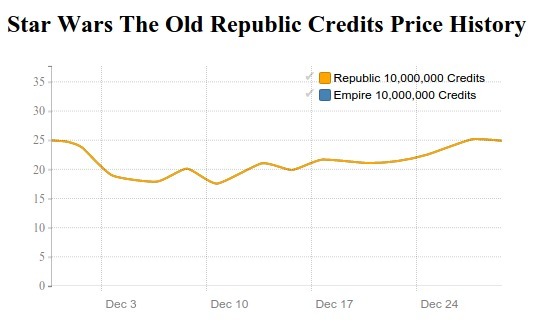 SWTOR US Credits price had been increasing rapidly since the first week resulted in a total of 40% increase in price. World of Warcraft Gold might not have had a significant price increase compared to SWTOR, but its price never stopped changing even for a single day. The decline of ArcheAge Gold price in November has completely stopped since the first week of December. After that, its price stayed in almost the same range until the end of the month. It is predicted that ArcheAge Gold price should be in this range for a few months before its next minor patch update. The cheapest was on December 14, 2015 which is 2,000 ArcheAge gold for (US) $33.13 and the most expensive was on December 28, 2015 for $34.32. The difference rate was a minor 3.59%. The total EVE Online ISK price was slightly lower than the previous month. However, the Vanguard update since October was still in effect. 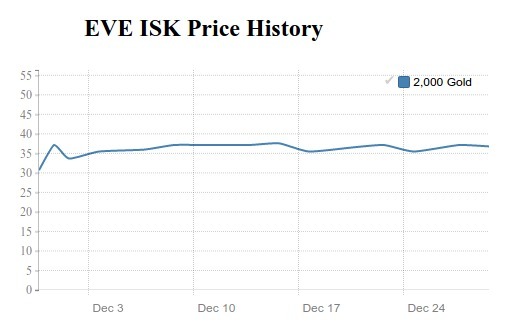 EVE ISK price was fluctuating at a rate of 5% for the whole month. It's expected to be within this rate in January but will be more stable. The cheapest was on December 18, 2015 which is 2bn EVE ISK for $35.47 and the most expensive was on December 29, 2015 for $37.57. The discrepancy was at 12.14%. Final Fantasy XIV gil price was suddenly around 12% more expensive in the last week of December after being in the range of $17.5 USD per 5mn gil for the whole month. One possible factor might come from their Free Login Campaign. FFXIV gil price should not change much in January. The cheapest was on December 11, 2015 which is 5mn FFXIV gil for $17.46 and the most expensive was on December 28, 2015 for $19.58. There was a 12.14% difference. Guild Wars 2 Gold price in December was quite similar to FFXIV. There was a sharp increase after being in the same range for several weeks. However, this time there was a 15% increase which occurred during the 3rd week of December. It was actually the first price increase after its severe drop last month. GW2 Gold price should not be much different in January. The cheapest was on December 07, 2015 which is 500 GW2 gold for $25.83 and the most expensive was on December 28, 2015 for $30.25. The discrepancy rate was 17.11%. After SWTOR US Credits had its most significant decline last month, it has been returning slowly and steadily to its original price. It reached the lowest point on December 11, 2015, $17.55 for 10mn Credits. Then, the price started to increase to as high as 15% per week. It is believed that the increase should cease soon when it is about $30 per 10mn Credits. The cheapest was on December 11, 2015 which is 10mn SWTOR US Credits for $17.55 and the most expensive was on December 30, 2015 for $24.45. The increase rate was as high as 39.32%. As predicted in November 2015 RMT Roundup, Tera Gold price has slightly decreased in December. Starting from the 1st week, its price had been staying in the range of $25.95 per 20,000 TERA Gold. Surprisingly, Tera gold price had a 10% drop in the last week of December while other games had enjoyed high prices during this holiday weekend. There's a chance of Tera gold price getting lower again in January 2016. The cheapest was on December 30, 2015 which is 20,000 Tera Gold for $23.33 and the most expensive was on December 14, 2015 for $25.98. The discrepancy was at 11.36%. WildStar released a special event called “Winterfest” which came with several features related to micro-transactions and public events. However, Winterfest did not have much impact on WildStar Gold price at all. For the whole month of December, WildStar gold had been mostly unchanging. Only in December 18, which was 2 days after the beginning of Winterfest, and in December 25 were the prices higher than in other dates. It's predicted that WildStar Gold price would be unchanged in January. The cheapest was on December 14, 2015 which is 5,000 gold for $49.95 and the most expensive was on December 25, 2015 for $53.76. The differences was minimal at 7.63%. 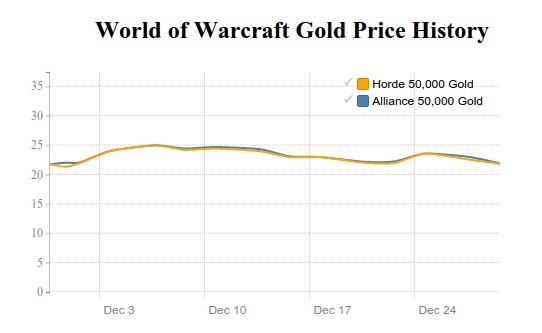 World of Warcraft gold price during December 2015 was totally different from other games in the roster for two reasons. First, it fluctuated widely. Its gold price never stayed the same even for a single day. The average fluctuation rate was about 5% daily. Second, it had the highest price on the first week while the lowest was on the last week. Since the World of Warcraft is still among the most popular MMORPGs in the world, it's possible that this fluctuation was from promotional campaigns from each shop that tried to drive sales as much as possible during this shopping month. It is believed that WoW Gold price in January should be quite similar to December, but far more stable. The cheapest was on December 30, 2015 which is 50,000 gold for $21.95 and the most expensive was on December 07, 2015 for $24.95. The discrepancy rate was 13.67%.